was given permission to publish this when I finally got my website done. what they are thinking.............a very special person. 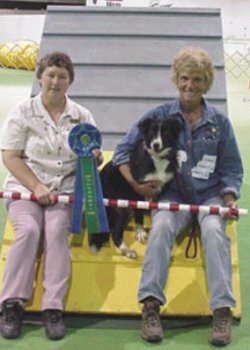 She achieved greatness in her life in herding and agility and just being who Bonnie was. at any one event and be quite successful. these dogs do the A-frame.. So take it lightly. dog looks like it's been trained with 4 jumps attached to the A-Frame. bottom yellow. Result, one of the fastest A-frames out there. Problems: getting one to hop in the right spots. waiting for a "click"/ treat ... and wondering why it's not coming. realize these targets at shows,..... don't quite taste the same? This is a dog who has no sensor nerves connected to the brain. This dog slides into the yellow on all fours, never feeling any pain. un-aware that there's any problem. #6. The invisible wire method. find them at the shows. #7. The "board jump" at the base. resulting in a REAL leap. #8. The big dog slide to-- oops 2 on 2 off. occasionally under their tail for wood splints up in there. #9. The big dog twist -- 2 on 2 off. in the blue, and 2 on the floor --- humm--- nothing in the yellow. #10. The "Too fast to see". were in the yellow or not. Conclusion: the judge may like to see it. #11. The "That's too fast". for a head stand in the dirt. Hmmm.... Back to the drawing board. #14. The "I've learned Everything". in.......Slowing down and questioning everything. Problem: Over educated. #15. The "Off to a tunnel bottom". This dog has learned to race off the yellow into a tunnel. of some more once I've sent it. No knocks meant against any style. Dogs are just being "dogs". Don't we all just love it?